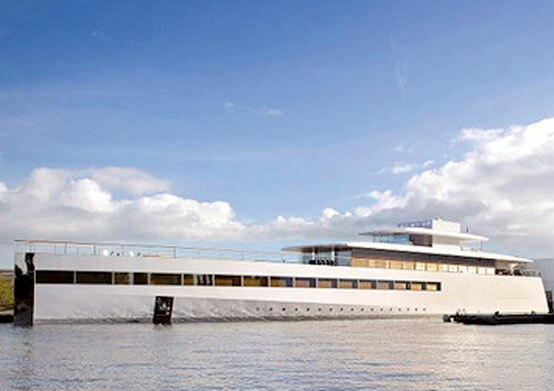 THE HAGUE, Netherlands (AP) — The sleek, white superyacht glistened under a gray autumnal sky, a posthumous testament to the design aesthetic of Steve Jobs. Just over a year after the Apple founder died, the luxury motoryacht he commissioned and helped French product designer Philippe Starck make has finally slipped into an anonymous Dutch backwater. Looking like a floating Apple store, it bears all the hallmarks of a new Jobs-inspired creation — crisp white lines, polished metal, glass. And secrecy. On Oct. 29, shipbuilder Feadship announced it had launched the 256-foot aluminum custom motoryacht Venus at its yard in Aalsmeer, just south of Amsterdam, two days earlier. Walter Isaacson described plans and models of the yacht in his biography of Jobs, who died last year at age 56.